An innovation which is going the rounds in the South Eastern Group, the ‘Travelling Tools’ of an entered apprentice Freemason, are a set of first degree tools mounted in a display case. The thought behind them is a means of assisting junior brethren to visit other lodges by passing around the ‘Tools’ and giving an explanation of their use both literally and Masonically. Pictured from left to right, are: Chris Stephenson (Andrew Lodge No 3328), Michael McGowan (Hand and Heart Lodge), Barry Kirkwood (holding the tools) and Ken Harding (Hand and Heart Lodge). It is likely that many new Masons felt a sense of trepidation when visiting their first external lodge. It is hoped that this initiative will ease the initial reluctance and overcome the awkwardness of that first step in visiting a lodge other than their own, by giving junior brethren a focus and purpose for being there. 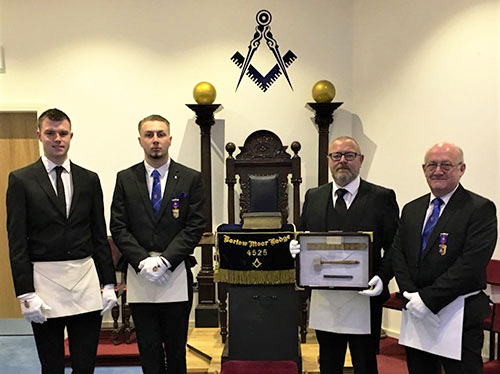 The ‘Travelling Tools’ made their first appearance at a recent meeting of Barlow Moor Lodge No 4525, where to get things started, they were presented to Barry Kirkwood, a new initiate to that lodge by Ezra McGowan of Hand and Heart Lodge No 4109 who has kindly donated them to the cause. The hope is that Barry will then visit another lodge, passing on the tools to another junior brother who will then visit a further lodge and so on. As all are aware, visiting other lodges is both interesting and instructive as no two lodges carry out ceremonies in the same manner no matter how slight the differences. Also, it is good to visit and broaden the Masonic experience and to make new friends and acquaintances in other lodges and even other Provinces to promote and extend the fellowship. These ‘Travelling Tools’ are therefore a means of communicating with other lodges and promoting the learning of basic ritual so let us hope they are passed on regularly from brother to brother as they were intended!